Count Alessandro Giuseppe Antonio Anastasio Volta (February 18, 1745 – March 5, 1827) was an Italian physicist who revolutionized science and technology by his invention of the electric battery. This invention was based on his many years of study of electrical phenomena, after he had won a reputation in the field. It inspired research in a wide range of scientific fields, from chemistry to physics to medicine, and laid the foundation for the age of electronics. Volta was born and educated in Como, Lombardy, in Italy. He did not speak until the age of four and appeared to be mentally backward, but by seven he was at the level of the other children and soon began to overtake the others. His parents, Filippo Volta and Maria Maddalena Inzaghi, were not wealthy, but with the help of relatives, sent him to the Royal Seminary in Como with the intention that he would enter the legal profession. But Volta, having already decided at an early age to pursue chemistry and physics as a career, eschewed law as a vocation, nor did he follow the footsteps of many of his siblings who became priests or nuns. In 1763 he began to correspond with the noted French physicist Abbe Antoine Nollet, suggesting in his letters an analogy between electrical and gravitational forces. In 1774 he became professor of physics at the Royal Seminary, and the year following, announced the invention of a machine that was capable of producing an electrostatic charge of almost unlimited quantity. Called the electrophorus, it consisted of a plate of metal into which a hardened resinous mixture was placed. The resin would be rubbed by a silk cloth to give it an electric charge, and another metal plate with an insulated handle would be placed on top of it. When the top plate was removed, and the resulting charge on it dispersed, it could be placed back on the resin and removed, and would accrue a new charge. This process could continue indefinitely, and the invention caused a small sensation in scientific circles. In 1776-1777, Volta studied the chemistry of gases, discovered methane, and devised experiments such as the ignition of gases by an electric spark in a closed vessel of his own design, called a eudiometer. Around this time he also suggested using static electricity to convey messages using insulated iron cables for transmission. He also embarked on a tour of European countries, one of many that put him in touch with the important scientific figures of his time, including Voltaire, Henry Cavendish, Benjamin Franklin, Antoine Lavoisier, Joseph Priestley, Pierre-Simon Laplace, Claude Louis Berthollet, Joseph Louis Lagrange and James Watt. In 1779, he became professor of experimental physics at the University of Pavia, a chair he occupied for almost 40 years. He devoted the next ten years primarily to traveling and perfecting the condensing electroscope, a device for detecting small quantities of electric charge, based on the electrophorus. In 1791 Volta was elected to the Royal Society of Great Britain. Around this time, Luigi Galvani discovered a connection between metallic contact and the movement of a frog's leg. Galvani identified the phenomenon as electrical in origin, but where the electricity came from was a subject of much debate. Volta concluded that the electricity was not from the animal, but from the metal implements that had come in contact with it, and for his lucid explanation, received the Copley Medal of the Royal Society in 1794. That same year, Volta married Maria Teresa Peregrini, the daughter of Count Ludovico Peregrini. The couple had three children. Volta continued to develop his ideas, culminating in a famous letter to the Royal Society in 1800 announcing the invention of the electric battery. Unlike the static electric generating machines, the electric battery produced a comparatively weak but steady electromotive force (a term coined by Volta) and a continuous current of electricity. The device presaged the electrical age that followed the Industrial Revolution, and quickly resulted in a number of important discoveries by other investigators. After his invention was made public, Volta gained instant fame and was celebrated by the famous scientists of his day. Napoleon Bonaparte, then the French head of state, paid particular attention to Volta and his invention, sometimes visiting him and always praising his work. Napoleon established an award for accomplishments in electrical science on a level with the investigations of Benjamin Franklin and Volta. Volta continued his teaching position at the University of Pavia for most of the next two decades. The death of his second son Flaminio at the age of 18 caused the inventor great distress. His other two sons, Giovanni and Luigi, survived him. Volta entered retirement in 1819, returning to the family estate in Camnago, near Como, the town of his birth. He died there in 1827 at age 82. Alessandro Giuseppe Antonio Anastasio Volta portrait. In honor of his work in the field of electricity, Napoleon made him a count in 1810; in 1815 the emperor of Austria named him a professor of philosophy at Padova. Volta is buried in the city of Como in Italy; the Tempio Voltiano near Lake Como is a museum devoted to explaining his work. His original instruments and papers are on display there. The building appeared, along with his portrait, on Italian 10.000 lira banknote, before the introduction of the Euro. In 1881 an important electrical unit, the volt, was named in his honor. Volta Crater on the Moon is also named after him. Volta's famous paper of 1800, “On the Electricity Excited by the Mere Contact of Conducting Substances of Different Kinds,” gives instructions for the construction of a voltaic pile or electric battery. It consists of succession of silver and zinc disks in contact with each other. Between each set of metal disks is placed a disk of pasteboard or absorbent material, a bit smaller than the metal disks so as not to overlap them, soaked in salt water. The series is repeated in a vertical column, or pile, for as many times as is convenient. The greater number of series in the pile, the greater is the electrical effect when the top and the bottom of the pile or battery are connected by means of a conductor, or even by a person's moistened extremities, when it delivers a shock. Because the pasteboard would sometimes dry out, Volta alternatively suggests using a series of cups filled with salt water instead of pasteboard disks. Volta also mentions the use of copper and tin as alternating metals instead of silver and zinc. Volta revolutionized science and technology by his relatively simple invention of the electric battery. This brainstorm did not occur from thin air, however. Volta had long studied electrical phenomena, and had already won a reputation in the field. He investigated the battery for four years before he made his results public. Even in his youth, Volta began correspondence with famous scientists, and later in life traveled widely to cement associations and keep abreast of the latest findings. While the battery appears to be a simple innovation, it was developed by one with great knowledge of and interest in the subject of electrical action. The invention of the battery inspired research in a wide range of scientific fields, from chemistry to physics to medicine, and laid the foundation for the age of electronics. Alessandro Volta on the 10000 Italian Lire banknote. 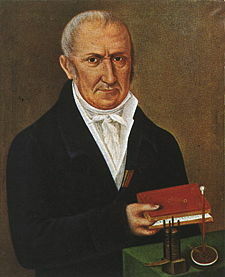 Catholic Encyclopedia article on Alessandro Volta. This page was last modified on 19 February 2019, at 17:13.